Witness the world of Full-HD 3D with active shutter 3D glasses. Compatible with all Toshiba Active 3D TVs. Witness the world of Full-HD 3D with active shutter 3D glasses. •Toshiba 3D Glasses, USB cable. Compatible with Toshiba TL868, WL768, WL863 and YL863 models. Battery life : 23h. All serial numbers had been recorded. • Compatible with Toshiba 48U7653DB. This creates a pair of your very own prescription 3D glasses. Compatible 3D Glasses. 1 Pair 3D3 A1112 Universal 3D Glasses for Toshiba 48U7653DBRF Connectivity. • 1 Pair of 3D Glasses. New active 3D shutter glasses. Outer film seal has been removed. Excelvan Universal 3D Active Shutter Glasses (Bluetooth) For Sony/Panasonic/Sharp/Toshiba/Mitsubishi/Samsung 3DTV. Supports Bluetooth signal for Sony/Panasonic/Sharp/Toshiba/Mitsubishi/Samsung 3DTV. • Compatible with Toshiba 40U7653DB. This creates a pair of your very own prescription 3D glasses. Compatible 3D Glasses. 1 Pair 3D3 A1112 Universal 3D Glasses for Toshiba 40U7653DBRF Connectivity. • 1 Pair of 3D Glasses. 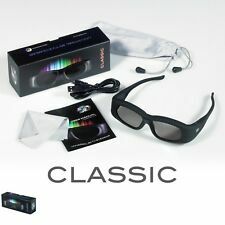 1 Pair 3D3 A1112 Universal 3D Glasses for Toshiba 3D TVs using RF Connectivity. Our 3D3 Universal 3D Glasses use active shutter technology for optimum picture quality. Coupled with our custom-built firmware, this clever combination results in the very best 3D experience. • Compatible with Toshiba 55U7653DB. This creates a pair of your very own prescription 3D glasses. Compatible 3D Glasses. 1 Pair 3D3 A1112 Universal 3D Glasses for Toshiba 55U7653DBRF Connectivity. • 1 Pair of 3D Glasses. 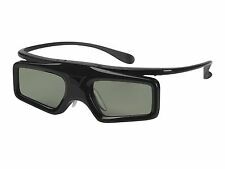 1 Pair 3D3 A1113 Universal 3D Glasses for Toshiba 3D TVs using IR Connectivity. Our 3D3 Universal 3D Glasses use active shutter technology for optimum picture quality. Coupled with our custom-built firmware, this clever combination results in the very best 3D experience. Compatible with all 3D DLP-Link Projectors that need active shutter glasses. TypeActive Shutter 3D Glasses. Projector Accessories. Display CompatibilityDLP Link Projector. High responsive liquid crystal glasses lens, reduce eyestrain. New Bluetooth 3D glasses compatible for TCL Toshiba 46L1305C, etc. for Panasonic WT50C Series DT50C Series Panasonic PDP Plasma TV VT50C Series ST50C Series UT50C Series XT50C Series New TV. For Toshiba Series: 46L1305C 46L1305C 46L3300C 46L1300C 46L3305C and other new 3D TVs. Passive 3D glasses have no electronics or active shutter. The passive 3D glasses use a pair of polarized lens for the 3D effect. Toshiba makes two types of 3D TVs that need 3D glasses, Dynamic (Active) and Natural (Passive). Work signal: Bluetooth. 1x 3D Glasses. 1x User Manual. 1x USB Cable. - Item size: Approx. - Battery: button battery. - Effective range: Approx. 10m / 33ft. Compatible with all 3D TVs with Bluetooth that need active shutter glasses. TypeActive Shutter 3D Glasses. Projector Accessories. High definition picture, no flicker, no ghost shadow, vivid 3D image. High responsive liquid crystal glasses lens, reduce eyestrain. 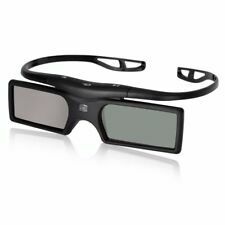 96-144Hz Active Shutter Rechargable 3D Glasses For DLP-Link Sony Samsung Toshiba. Compatible with all 3D DLP-Link Projectors that need active shutter glasses. TypeActive Shutter 3D Glasses. Projector Accessories. Active shutter technology for the very best 3D realistic effects. Single CR2025 battery (not included) powers glasses for up to 80 hours. 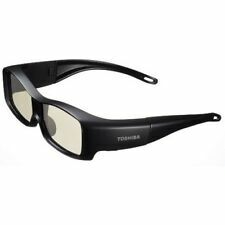 Toshiba FPT-AG02G Active Shutter 3D Glasses for Toshiba 3D TV Black. Glasses only! Unfortunately there is no charger cable. Condition is Used. Perfect match 3D DLP preparation logo and DLP link projector. SYNC operation: DLP link. Shutter: liquid crystal lens. 3D Type of glasses: Shutter. - Automatic power off function: If the 3D projector is not turned off or synchronized with the 3D signal. 3D GLASSES. TOSHIBA ACTIVE. in Plastic Case. This New version Bluetooth 3D glasses utilizes advanced active 3D shutter technology. Sleek style and ergonomic design make you wear it comfortably and high speed response LCD lens won't cause your eye fatigue. Compatible TCL Active Bluetooth 3D TVs Models:L39E5690A-3D L40F3320-3D L46E5590A-3D L46E5500A-3D L46V7600A-3D L48E4650A-3D L48E46XX L48F3500A-3D L46F3500A-3D L50E5500A-3D L50E5690A-3D L55F3500A-3D L55E5690A-3D L55E5590-3D L55V7600A-3D L65V7600A-3D L55V5800A-3D. In Brand Spankin' new condition, never used. Comes with all accessories, original case, screws, and all. For use with 3D Active TV's. Designed for use with Toshiba Active 3D TVs . 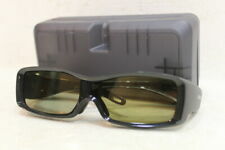 3D Active Shutter Glasses - FPT-AG03. 3D Active Shutter Glasses. 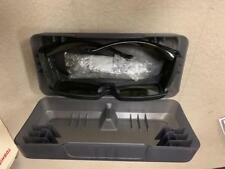 Box content 3D Active Shutter Glasses. Colour black. User's Manual. Never used, but no box. Our all new N11 universal 3D glasses are engineered with So simple to use…just press the ON button, hold it, and the smart thinking N11 3D Glasses will seek out your signal and connect. N11 Universal 3D Glasses. Compatible with 2012 ~ 2017 (or later )Sony 3D TVs. Compatible 3D TVs models: KDL-65W850A KDL-55W950A KDL-65W900A X940C, X930C, X910C, W850C, W800C, TDG-BT500A, TDG-BT500A TDGBT500A TDG-BT400A TDGBT400A. 3D Glasses Black. Toshiba FPT-AG01U.